For one thing, “Made in America” has got to make long term economic sense. The good news is China’s cost advantage has been slipping because of rising fuel prices and higher wages among Chinese workers. We now have an unprecedented opportunity to get our business back. Quality and design will be key, but technology just might be the best trump card we’ve got. If we can figure out ways to bring technological innovation to the shop floor, we can boost manufacturing efficiencies. – Rachel Weeks, Founder and CEO of School House a collegiate apparel design company located in Durham, NC. Rachel’s comments were recently featured on American Public Media Marketplace. Congratulations to Rachel, who is committed to working with American manufactures. Her fashion-forward collegiate line is one hundred percent American Made. School House supports over 2700 jobs in clothing manufacturing across North Carolina by sourcing local fabrics and hiring local companies to cut and sew. School House even works with NC based packing and shipping companies. Wow! I am so impressed. A big thank you to Rachel and her team for leading the way back to Made in America. It’s quite odd that I don’t know how to sew. My great-grandmother was an accomplished seamstress, having sewn all the clothing for her three children. 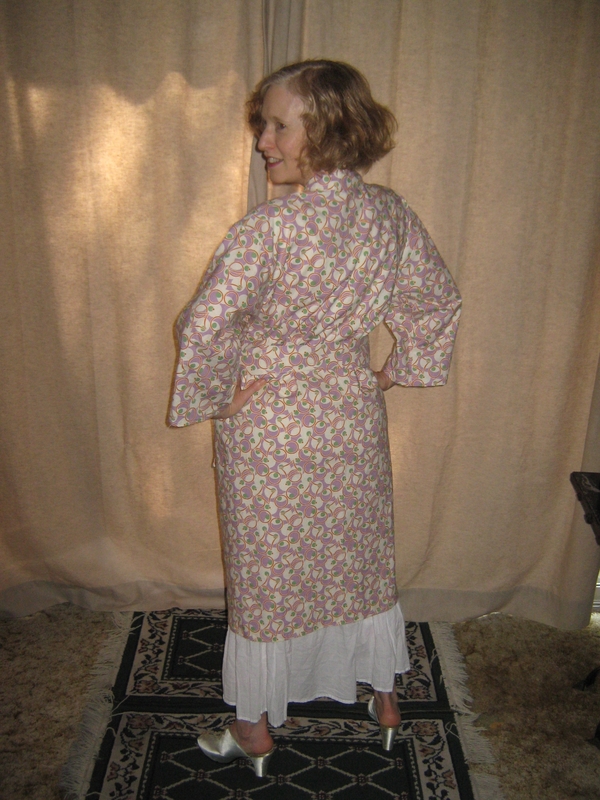 My grandmother did one better and not only learned to sew but also studied fashion design. 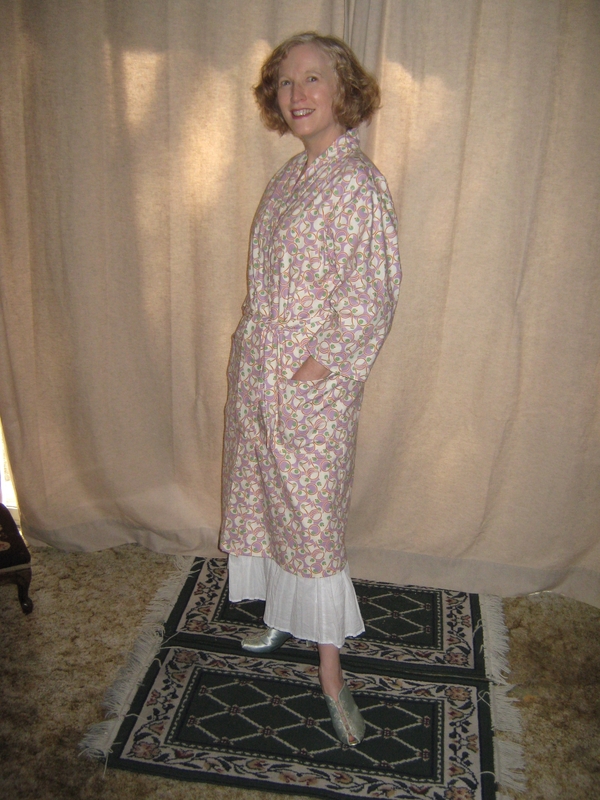 My mother also made some of her own clothes including all her maternity dresses – Vogue patterns no less. I started off promising at nine-years-old with a small sewing machine of my own, but I could never get the bobbin to work right. Later I learned how to hand sew in a quilting class and I’ve always appreciated having that skill. But in my generation, sewing was not important. Mom was working so she didn’t have time to teach me and home economics in school was a thing of the past. My interest faded and that was that. Until now. Since I write about fashion, I want to understand the basics of clothing construction. So I recently took a beginner sewing class at Stone Mountain and Daughter with Alice Elliot. Oh boy it was a challenge, but fun and satisfying. 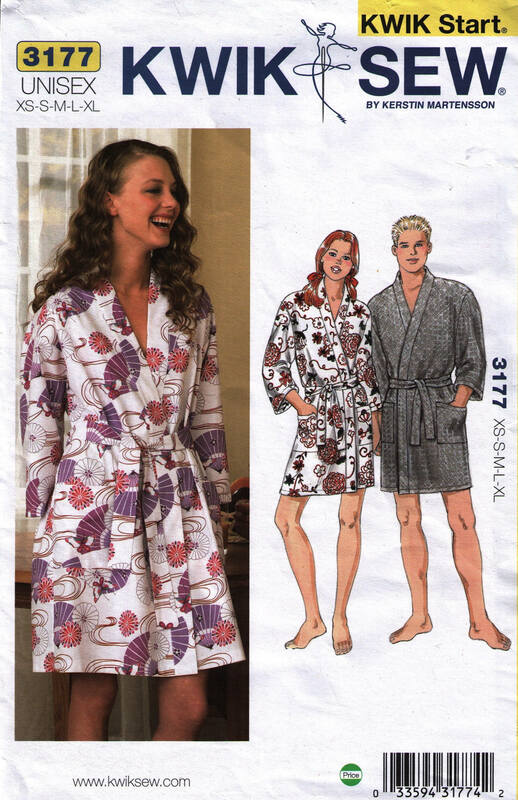 I chose to make a kimono-style robe from Kwik Sew – a company known for their simple-to-use patterns. The whole process is a bit of a blur but my approach was to take it one step at a time and follow the instructions, which often made no sense to me (simple-to-use is relative). Luckily, Alice saved me several times from messing up. Bridget Foley. Photo: Getty Images. … houses have become brands, administered by ceo’s; some are parts of great luxury groups, brands unto themselves. Their operating principle (if not the price of their wares) is practically Marxist: The brand is supreme. The individual exists for the good of the brand. In her WWD column on June 28th 2012, Ms. Foley discusses the issue of corporations buying closed fashion houses and then hiring designers to help set the tone and style of the new brand sporting the old name. The designer becomes all about the brand. I’ve been following this trend and the latest is Diego Della Valle’s purchase of the Schiaparelli name. Elsa Schiaparelli was an Italian fashion designer popular from the late 1920s through the 1940s. Her house closed in 1954. Vinatge Schiaparelli pieces are highly collectable. Mr. Valle is President and CEO of Tod’s, a high-end Italian shoe and handbag company. As of now, the new Schiaparelli brand has set up offices in NYC and they are in the process of looking for a designer. The intent is to unveil the reinvented line in January 2013. How ironic that the Schiaparelli name, one of the first to blend art with fashion back in the 1930s, will now be a corporate brand. It will be interesting to see how the hired designer will rework the distinctive Schiaparelli style for a modern audience. 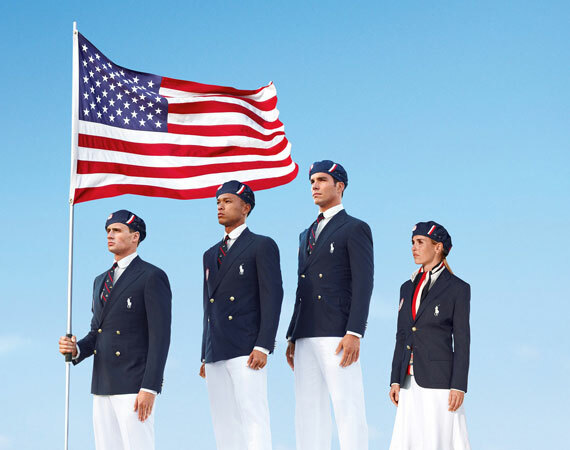 The country was outraged last week when it became known that Ralph Lauren’s U.S. Olympic uniforms were made in China. This past weekend the company released a statement promising that the 2014 Winter Olympics uniform (also a RL design) will be made in America. Following the scandal, the Olympic Committee announced that it intends to change its policy requiring that all U.S. Olympic uniforms be made in America. Loggerhead Apparel in Greenville, South Carolina, American Giant in San Francisco, CADET in Brooklyn and many more manufacturers have made it clear that they would be proud to supply the U.S.A. Olympic Team with uniforms sporting a Made in America label. Image courtesy of Liscaro Scarves. Way to go, America! Take note Ralph Lauren and all the other fashion corporate brands out there: Clothing manufacturers still exist in the United States and they are ready for business. Hire them! A hat is something you wear for pragmatic reasons. Millinery is for fashion. – b. Michael told the Houston Chronicle in 1988. 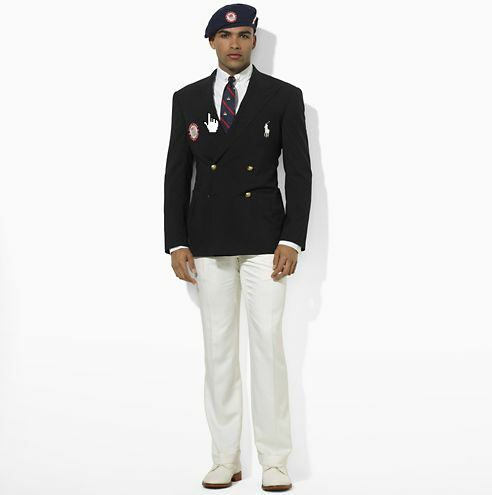 Ralph Lauren US Olympic uniforms sport a Made in China label. The iconic American designer Ralph Lauren has made a serious misstep by having the entire U.S. Olympic Team’s opening ceremony uniform made in China. Does RL really think this is OK? Is the company that cheap? So far we don’t know what they think as there has been no direct comment on the issue. What a waste of an opportunity to give a much-needed boost to local production as well as highlight the fact that clothing manufacturing in America is still possible and preferable. Beyond that, it’s a bad reflection on the Ralph Lauren company and the U.S. Olympic Committee. Come on, American Olympic uniforms should be made in America. Period. It’s very disturbing because it completely could have been manufactured here in the United States in New York City or in any other city where there’s factories that still exist. And it’s frustrating for us because it’s a cause we’ve been fighting for, and we’ve been trying to raise awareness and trying to convince designers to move work back to our shores and stop off-shoring and start on-shoring. This would have been the perfect opportunity. Although I have always been a fan of the Ralph Lauren style, the reality is that the line is not a fashion house it’s a big corporate brand. Sometimes corporate brands lose their focus while striving for big profits. What a shame. Yes the uniform looks good, but it’s not made in America and like an ill-fitting suit, it feels all wrong. Chloe Sevigny for Miu Miu. It’s true I don’t enjoy going to fashion shows. It’s very high school, it’s very the most popular kids in the front row. And everybody’s checking everyone else out. It’s not fun for me, it’s work. Chloë Sevigny – Independent film actress and fashion It Girl. Ms. Sevigny may not care for fashion shows, but she does enjoy fashion. In addition to designing her own line called Open Ceremony, she’s the new celebrity model for Prada’s Miu Miu. Watch for her print ads this fall.